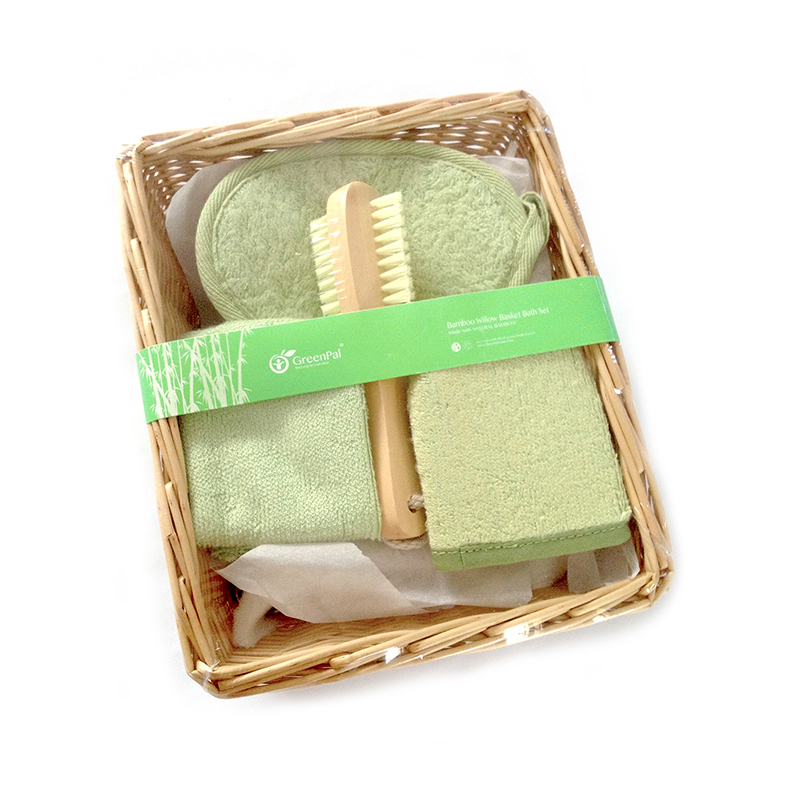 Bamboo Willow Basket Bath Gift Set is made with natural bamboo fiber. Packaged with willow rattan basket. It is incredibly gentle on your skin. It consist of a bamboo oval bath pad, a bamboo fiber face scrubber, a bamboo fiber hankerchief and a wooden brush. And, as with most Bamboo products, the more you use it the softer it gets. Use it daily with your favourite shower gels and soaps. Bamboo is an exquisitely soft fabric, it's also one of the most sustainable natural resources available. Made with natural Bamboo fiber. Basket made with Willow Rattan. Bamboo, a renewable resource, is grown without using pesticides or chemical fertilizers. Bamboo is one of the world's most prolific and fastest-growing plants, and is able to reach maturity in about four years, compared to the typical 25 to 70 years for commercial tree species in around the world. Bamboo is nature's most sustainable resource and is naturally regenerative. Harvesting bamboo does not destroy its root system, meaning there is no topsoil erosion or run-off. Harvesting of bamboo minimally impacts the wildlife, compared to hardwood "logging," where big machinery tears the land apart. 1 bamboo oval shape bath pad. 1 bamboo fiber bath glove. Hand wash in warm soapy water. For best results use wet with natural cleansing liquid. Rinse before first use and after each use and hang to air dry. DO NOT use it with washing machine. Doing so will reduce the lifespan of the product.